The church is always reforming, not because God changes or the truth changes. No, it is always reforming because the church is made up of human beings. Every one of them sinful. Every one of them tempted to ignore the Word of God or to substitute his or her own ideas for God’s truth. It is easy for Christians, and for churches, to become confused and to drift from God’s Word and will. 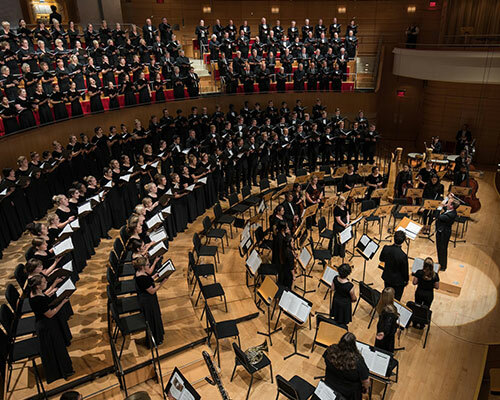 The Renée and Henry Segerstrom Concert Hall resounded with music, song, and spoken word during the once-in-a-lifetime celebration of the 500th anniversary of the Reformation. More than 500 musicians, speakers, and dancers joined the sell-out crowd of over 2,000 participants in what was the largest celebration of the Reformation on the West Coast. Late in 1517, Martin Luther was a little-known monk and professor at a new university in Wittenberg Germany, a minor town on the outskirts of the Holy Roman Empire. Although he had previously taught against unscriptural doctrines, he was virtually invisible to the powers in Rome. Invisible, that is, until he stepped into the indulgence controversy. The papal court was participating in an elaborate financial scheme whereby the sale of indulgences—papal certificates to forgive sins—would help finance the rebuilding of St. Peter’s Basilica in Rome. When Luther heard of these sales in a neighboring area, he wrote 95 theses for academic disputation, condemning the sale of indulgences. When, on October 31st of that year, he nailed the theses to the door of Wittenberg’s castle church, they were soon copied and widely dispersed. Suddenly Luther was quite visible, directly in the cross-hairs of the papal court. Many prominent voices in Luther’s time were critical of the corrupt papacy, but Luther’s message was different. He called not only for moral reform, but for theological reform. The sale of indulgences was merely a symptom of departures from Scriptural teachings such as justification by faith alone, through grace alone, for the sake of Christ alone. Luther was soon excommunicated, and his teachings banned. He was not easily silenced, however. He preached, taught, and wrote prolifically, all the while longing for Mother Church to return in unity to her apostolic roots. There appeared to be an opportunity in 1530, when Emperor Charles V called for a meeting of imperial leaders at Augsburg. The goal was to heal the religious differences that plagued the Empire from within, while the Turks were a threat from without. The Lutherans presented a sound and winsome case in the Augsburg Confession, but the papal faction was hardened against their teachings. Religion would remain a dividing factor in the Empire, and Luther’s reform would remain a reformation, an institutional division that marks the Church even today. Concordia University Irvine is “guided by the Great Commission of Christ Jesus and the Lutheran Confessions.” We rejoice that Christ came for all (John 1:29) and that we are saved by grace through faith in Him. Confident in the Gospel, we welcome students from a wide variety of backgrounds, as we pray and work for the unity of the Church, which is redeemed by Christ and always reforming. Dig deeper. Learn more about the Luther Seal and how it summarizes the gospel. It’s still all about Jesus. 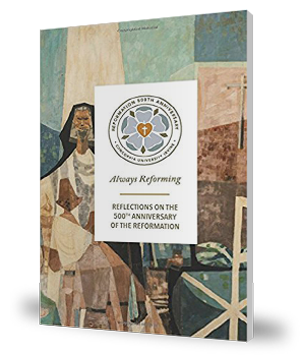 The brief essays in this volume explore various aspects of Reformation theology and its implications. They were written by faculty of Concordia University Irvine in commemoration of the Reformation's 500th anniversary. Musical resources for the Reformation - free to view and download. Dr. Jeff Held presented at the Concordia Reformation Lectures at Christ Lutheran Church (Costa Mesa) on June 11, 2017. Commissioned by The Concordia Choir and Concordia Sinfonietta for the 500th anniversary of the Reformation. The setting opens and closes with the blows of Luther’s hammer ringing through history; the piece itself works its way through Luther’s original Renaissance setting, Bach’s famous harmonization, and more modern treatment which nevertheless draws from Luther’s original melody and rhythms. Suitable for worship or concert settings, while never becoming unnecessarily difficult. Scored for organ and SATB choir with optional congregation. Optional available accompaniments available for piano (compatible with any of the other options), or brass and percussion, or full orchestra. An accompaniment CD recording is also available (organ/brass/percussion version). Also available for SSAA or TTBB choirs. "Isaiah, Mighty Seer in Days of Old" (JESAIA, DEM PROPHETEN) is a hymn that is known as Luther's German Sanctus, as incorporated in his Deutsche Messe of 1526. The melody is a free adaptation of an old church plainsong chant. Luther's musical advisor, Johann Walter, commented that this hymn expertly merges text and melodic gesture. The 1613 antiphonal setting of this hymn, by Michael Praetorius, does the same through triumphant musical emphasis on the repeated words, "Holy is God, the Lord of Sabaoth." This transcription, for groups of wind instruments, retains a close depiction of this text. "Triune God, O Be Our Stay" (GOTT DER VATER, WOHN UNS BEI) was a text written by Luther and published in the first Lutheran choral songbook in 1524. This Praetorius setting alternates between two choirs, to dramatic effect. "From Depths of Woe I Cry to Thee" (AUS TIEFER NOT) is a confessional hymn by Luther that paraphrases Psalm 130. This orchestral arrangement is from Luther's musical partner, Johann Walter, who, under Luther's encouragement, created polyphonic settings of Luther's hymns for use in worship and teaching music in the schools.